Are You a Teenager Who Feels Down and Hopeless? Do you feel unable to shake a feeling of sadness? Are you uninterested in going out with friends, playing sports or doing other things that you once enjoyed? Are you struggling to concentrate at school or complete your homework? Do you feel as though no matter what you do, you can’t win? Do you wish that you could talk to someone who understands, but are afraid that others will judge you or your mood will bring them down? Depression can make life feel heavy and dull. You may feel as though everything is just a little bit harder for you, especially when everyone around you seems happy and full of life. Maybe you have lost your appetite or feel as though the only thing you want to do is eat. You might have trouble getting out of bed in the morning. Going to school might be a burden, which can feel even heavier if you’re frustrated by your inability to concentrate. Maybe you want to just be by yourself, and you’ve begun isolating yourself from your peers during lunch period and after school. For many teens with depression, nighttime is the most difficult. You may lie awake unable to sleep, even though you have felt exhausted all day. Maybe you can’t quiet your mind down as negative thoughts about things you believe you did wrong swim through your head. You may have had thoughts of self-harm or wondered if the world would be a better place without you in it. Perhaps you feel alone and as though no one could possibly understand what you are going through. It may feel as though everything in your life is cast under a dark shadow that you don’t know how to shake. If you are feeling depressed, hopeless and helpless, you are not alone. 11 percent of teenagers will experience a serious depressive episode by age 18. The teenage years can be incredibly difficult. You are probably beginning to think about how others see you in a new way, along with asking yourself questions about who you are and what your role in the world may be. Teenagers experience so many pressures about body image, sexuality, relationships, socializing, academic achievement, extracurricular participation and more. And if you are struggling with depression, all of this becomes even more complicated. Some people may have told you that the teenage years are the best years of your life. Even though you see your peers posting smiling pictures on social media, for many teens, the high school years are actually quite hard. You think of yourself as independent, but your parents might still treat you life a child. You might feel as though you are always on stage, both at school and on social media, and you aren’t living up to what people expect of you. All of these feelings and fears are completely normal, but sometimes, they can become overwhelming. If you have had thoughts of harming yourself or have attempted to harm yourself, it is especially important to seek help. Thankfully, you can find a way to feel better and more optimistic about your future. Therapy is very effective in helping teens experiencing symptoms of depression. The more depressive episodes you have, the more likely it is that depression will become chronic in your life, so it is important to seek help as early as possible. Whether you’ve experienced many bouts of depression or if you’re experiencing depression for the first time following a loss, trauma or significant transition, counseling can offer you the support and tools that needed to experience relief. With help and support, you can become better equipped to cope with down emotions so that you don’t have to feel weighed down by deep depression. In our sessions together, I will listen to you with compassion and understanding. You can share anything and everything you are feeling without fear of judgment. During our very first session, I will chat with you and your parents to make it clear to them that everything you tell me is confidential. I will only disclose details from our sessions with your parents if I fear that you or someone else are in danger, and even then, you and I will work together on how to tell them. It’s up to you to decide how involved you want your parents to be in your therapy. Throughout our work together, I will help you develop skills so that you can better cope with depression and challenges in your life. I can teach you effective ways to relax, manage your time, communicate with your parents and challenge negative thoughts so that you can use your thinking for good. We can also look deeply at the source of your depression and discuss traumatic experiences you may have had. I won’t try to force false optimism on you. Teen depression treatment will be tailored to you and your needs, and together, we will come up with realistic goals for you. Regardless of how you are feeling right now, you are not alone, broken or “crazy.” Mental health issues range in ways that can be compared to anything from the common cold to pneumonia to serious lung disease. Typical sadness is something like the common cold, and it usually goes away on its own. When it persists (and becomes depression), it looks more like pneumonia. With treatment and attention, you can get better. You don’t have to struggle with your sadness alone. You can have an amazing future. How do I tell my parents? Can I just come to teen depression treatment alone? In the state of Hawaii, a person under the age of 18 cannot attend therapy without the consent of a legal guardian. One of your parents or guardians will have to come to the first session, but then you get to decide how involved you want that adult to be. I have a great deal of experiencing explaining to parents how important your privacy is. In that first session, I will explain to your parents that no one is to blame, and that you are doing the best thing for yourself by asking for help. When you go to parents and ask to seek counseling, you are making a brave first step toward a happier, lighter future. I have a friend who was helped by medication, but I don’t think my parents want me to take it. 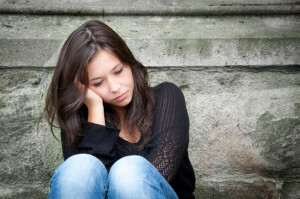 The gold standard for teen depression treatment is a combination of medication and therapy. Sometimes, depending on your particular needs, therapy alone can help. I have experience speaking with doctors so that we can find the best mode of treatment for you. I will discuss medication with you and your parents so that you can make a choice that feels safe and healthy. If you decide that you can benefit from medication, we will keep an eye on your progress to assure that everything goes smoothly. I’ve been thinking of hurting myself, and I worry that I’ll be locked up if I tell someone. It is common for teens to have suicidal thoughts, but this is also a serious symptom and a sign that you need to seek help. If you talk about your thoughts of self-harm, you can likely be helped in weekly therapy sessions. I will only suggest in-patient care if I feel you are a threat to yourself or others. However, even if in-patient care seems like the best option for you, you will not be “locked up.” Generally, hospital stays are short and effective. In all of my years working with teens, I have suggested very few hospitalizations, and when this has occurred, most teens find brief hospitalization to be a positive part of their treatment. In general, I will help you find the best possible help so that you can work through the pain you are experiencing. You don’t have to suffer alone anymore. I invite you to call (808) 747 3445 for a free 15-20-minute phone consultation to ask any questions you have about teen depression treatment and my practice.